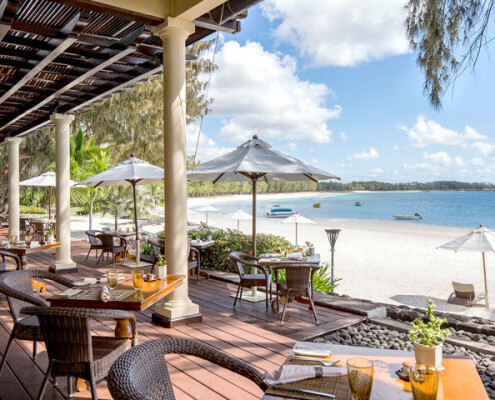 With over a kilometre long beach of powdery white sand, The Residence, Mauritius is one of the most beautiful jewels of the international hotel scene. 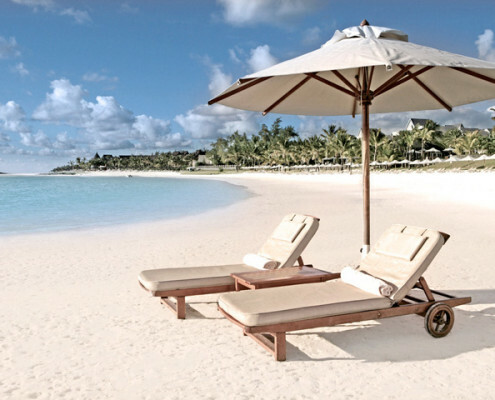 Indulge in the breath-taking beauty of this beachfront paradise fringed by the azure Indian Ocean and tropical gardens. This idyllic retreat blends modern elegance with classic Colonial style. 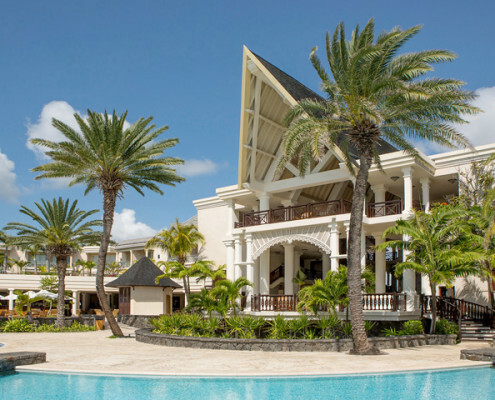 The Residence, Mauritius will enthral you under the warm glow of the Mauritian sun, be it a romantic escape or a spectacular beach getaway with the family. The hotel is located on the East Coast in the beautiful Belle Mare area, approximately a one hour/48km drive from the airport. The Residence, Mauritius offers a variety of luxuriously appointed Rooms and Suites, each with a spacious private balcony, patio or terrace. Decorated with a blend of simplicity and elegance, the exquisite accommodation provides an atmosphere of calm and tranquillity. 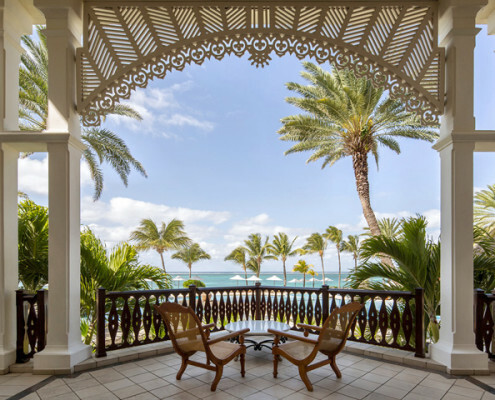 From the Colonial Garden View Rooms, Colonial Ocean View Rooms and Colonial Ocean Front Rooms through to Junior and Senior Garden View and Ocean View Suites, the choice is yours. 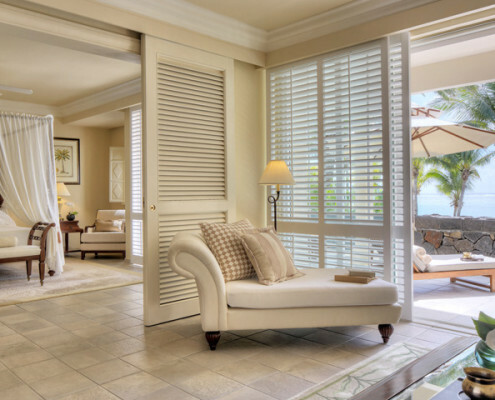 The plush and spacious Colonial Ocean View Suites and Colonial Ocean Front Suites offer a level of luxury unsurpassed on the islands of the Indian Ocean. All Rooms and Suites are fully equipped and feature air conditioning, overhead fan, satellite TV, DVD player, iPod docking station (on request), IDD telephone, complimentary WiFi, mini-bar, coffee and tea making facilities, Nespresso machine in the Suites, personal safe, a range of bath amenities, bathrobes and slippers and hairdryer. Twenty-four hour in-room dining is available and a private butler service on request. A diversity of fine recipes from around the world is available in our restaurants, offering a symphony of tastes and aromas crafted for the delight of discerning palates. Experience this beautiful island through Mauritian cuisine, characterised by an exciting medley and unique blend of Indian, Chinese, European and Creole influences, cooked with love using native produce of the island, and flavoured with a wonderful variety of exotic spices. Overlooking the pool, The Dining Room offers a sumptuous breakfast which includes both Western and local specialities. The atmosphere of the restaurant moves to one of sophistication in the evening. The spices of Mauritius are combined with international recipes, producing a fusion of enticing flavours within the sumptuous buffet or set menu. The lunch menu at The Verandah features a choice of exciting light dishes, served around the pool and overlooking the sea. Creole cuisine is the order of the day at The Plantation, set in a planter’s house by the beach. Several nights a week, The Plantation comes alive with the enthralling rhythms of traditional Sega dance performances. Kick back, relax and unwind with refreshment and entertainment at The Bar. Enjoy a late breakfast, traditional high tea in the afternoon or an evening cocktail as the sun sets over the ocean. Live musical entertainment is provided in the evenings. Swimming pool, Fitness Centre, water skiing, windsurfing, Hobie Cat, canoe, kayak, paddle boats, glass bottom boat, snorkelling, tennis and tennis lessons, beach volleyball, golf, zip lining, deep sea fishing, Catamaran cruises, undersea walks and Scuba diving. The Planters Kids Club, inspired by a sugarcane plantation house, is nestled just steps from the beach. A creative and efficient team of professionals will keep young guests 3 to 12 years old happily entertained during the day. Activities include includes treasure hunts, snorkelling and cooking classes, picnics, pony rides and much more. Delicious buffet lunches and dinners can be enjoyed outdoors under a tropical canopy in the gardens or indoors. Babysitting is available at a nominal fee. 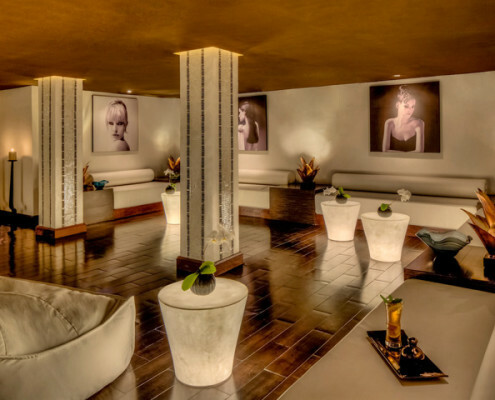 Dedicated to the wellbeing of the body and mind, The Sanctuary is a temple to relaxation offering a wide range of massages, custom-made programmes and treatments. The Sanctuary Spa is designed to soothe away stress and restore ones sense of balance, taking its inspiration from Zen philosophy and where every consideration is given to your particular need. The Spa Pavilion is located in the centre of the tropical garden overlooking the lagoon, allowing one to relax totally in the gentle sea breeze. 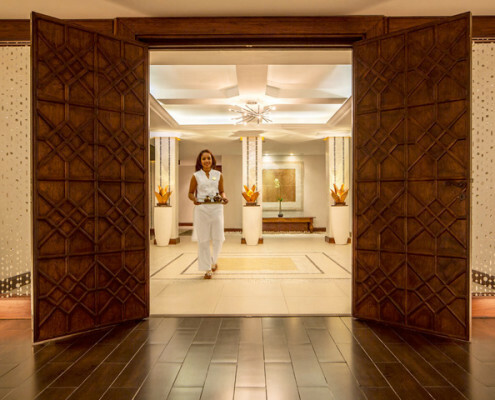 The selection of treatments and programmes available in our numerous treatment rooms includes Pilates, Serenity walk, Stretching, Yoga, Meditation, Massage, Thai stretch, Aqua Gym and personal training. Our beauty and hair care products have been designed by the prestigious French brand CARITA, with an exclusive concept called Haute Beauté. 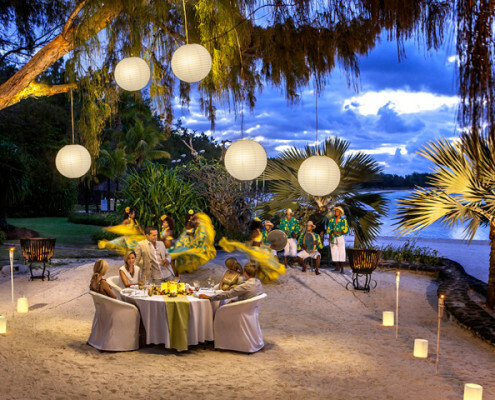 For the wedding or honeymoon of a lifetime, The Residence, Mauritius offers a variety of dream venues for that special occasion. Our experienced staff will assist with every aspect of the ceremony and celebration, organised to perfection. Facilities at the hotel include Boutique and gift shop, Business Centre and a DVD and CD Library.